The teas tasted one day last week were: Silver Tip Oolong from Taiwan (aka Oriental Beauty), Jade Kuan Yin (Special Grade), Ti Kuan Yin (1st Grade), and Imperial Gold Oolong (the last three from Fujian, China). Lower left is Silver Tip Oolong (Taiwan); upper left is Jade Kuan Yin; upper right is traditional TiKuanYin; lower right is Imperial Gold Oolong. Teas are sampled in order to decide on purchases and those selected samples are cupped again against incoming teas when they arrive. 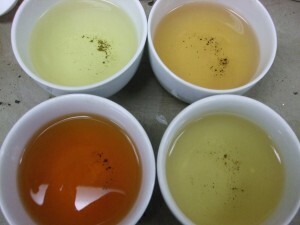 A recent arriving shipment yielded this colorful small group of Oolongs gave this colorful range. As I began to clear the tasting sets, I viewed the cups before me and thought about what a consumer might make of such a collection, someone quite new to teas, interested in learning more. What do the various colors tell us? that these come from different tea categories? Surely they must, given the very pale golden hue of one versus the deeper amber of another cup. 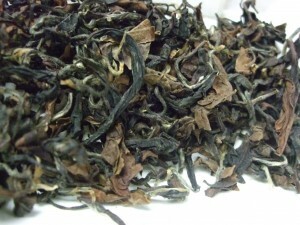 Is the darker cup similar to the standard restaurant Oolong that is often a consumer’s first encounter with Oolong? This small set of 4 Oolongs came together because they arrived the same week. How might such a simple group provide a quick lesson to a beginner in tea? Two of the teas in dry form look virtually identical (see immediately above and below); so in what way are they different? Sniffing the dry leaves will not shed much light on these teas; they contain no added flavors or essences, and any aroma the dry leaves give off is mild and not very revealing. And if we inspect further by looking at the infused leaves, what information might they convey? How might presenting this set of four cups make for a teaching moment to someone starting out in exploring teas? I can think of other combinations that could provide a similar lesson, about processing, about knowing what to expect based on processing methods, and how to conceptualize tea categories. But these were the four in front of me. A good illustration not only about how so many teas are made from one plant, but that even within one category, which is defined by one type of processing, there can be such a range of flavors. These 4 cups placed together throw the spotlight on processing method, and how the craft contributes to what the raw material will dictate. Wet leaves: some mugs show very open leaves, almost flat, and quite green, as shown immediately above. Another mug reveals darker/brown leaves that are more rolled up. My bet is that most tea drinkers would be drawn to the Jade Kuan Yin; it is floral and friendly and therefore very accessible. If the Imperial Gold Oolong were not placed by the Jade Kuan Yin, the Imperial Oolong would probably emerge as an easy favorite for the same reasons: slightly floral, not smoky, an easy cup. Ti Kuan Yin undergoes many rolling steps, and we see wet leaves that are only partially opened after the first infusion, an indication to us that these leaves will yield more flavorful infusions. The more open leaves of the Jade Kuan Yin after the first infusion, on the other hand, tell us that much of what the leaves have to offer have already been given up. Their olive green hue is a sign of the briefer oxidation period; contrast this with the darker brown of the standard Ti Kuan Yin, which was allowed to oxidize longer and which also underwent longer firing. 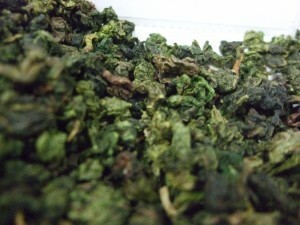 What about the Imperial Oolong: in dry leaf form, it looks almost identical to the Jade Kuan Yin. What accounts for the difference inf flavor, and its lower cost — about 2/3 the cost of the Jade Kuan Yin? 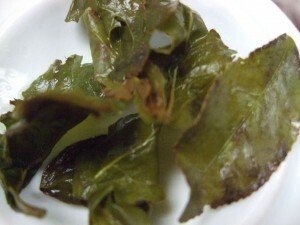 Processing methods for these two teas were similar; both were lightly oxidized, sitting on the greener side of the Oolong spectrum, more on this below. But the raw materials tell the story here: Jade Kuan Yin refers to a style, but it comes from the Ti Kuan Yin cultivar, whereas the Imperial Oolong is not a Ti Kuan Yin at all. So why is the Silver Tip Oolong/Oriental Beauty so much more expensive if it is not an immediate favorite from such a sampling? This tea from Taiwan carries an altogether quite different story. Higher labor costs in Taiwan are not the only factor accounting for the much higher price. it is a very different looking tea; no trained eye is needed to detect this. 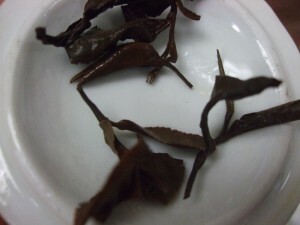 The other three teas display rolled up, nugget-like leaves; this one has open, brown leaves flecked with attractive silver tips that stand out against the darker background. At this point, my imagined tea consumer will have guessed that this is one of those darker Oolongs,and yes, it has a fine flavor, but why so costly? 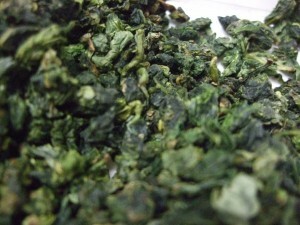 First, there is only one harvest of Oriental Beauty Oolong per year in Taiwan, and only young budsets are plucked. Therefore, the output is limited. 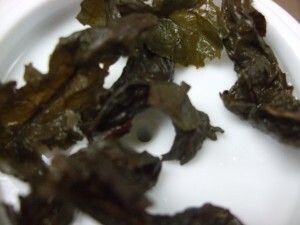 The plant is known as Big Slow Varietal (da man zhong) Oolong, and during processing the budsets that have fine downy hairs become the silvery-white tips among the finished leaves. These are known as “white sproutings” or bai hao. Indoor and outdor withering can take up to 10 hours, and there is only one gentle cycle of rolling, resulting in that open-leaf look. High oxidation, 75-85% coaxes out the peachy, umami notes that distinguish this classic Oolong from Taiwan. Contrast this method to the intense rolling and roasting, and sometimes post-processing baking that are a part of Ti Kuan Yin making. Together, viewed as a set, these 4 cups show why it is more edifying to think of teas along a continuum of oxidation instead of conceiving them as falling into discrete categories. With an eye using the first framework, we can understand why some Oolongs are so close to Green teas and why others, still classified as Oolongs, seem to share more characteristics of Black teas. and so forth. The idea is to provide a context in which our imagined tea consumer can learn to see, appreciate, and taste fine distinctions. Equipped with some preliminary knowledge about processing, this consumer is sure to be amazed, as we continue to be, by the myriad flavors elicited from one plant. What Does “Ming Qian” Tea Mean? Lydia Kung drinks tea every day, not just for work commitments but for personal enjoyment as well. Of trips taken, including vacations, journeys to tea gardens remain standouts. For such a minimalist product, the leaves have a story to tell, and more delicious teas await! Subscribe to the Reading the Tea Leaves feed to get the latest articles from my blog. The feed is available in RSS and Atom flavors.